Did you know that only 12 percent of U.S. homeowners have flood insurance, according to a recent poll conducted by the Insurance Information Institute? The other 88 percent of the U.S homeowners don’t believe a flood will hit their home or think that their homeowners insurance offers protection against floods. 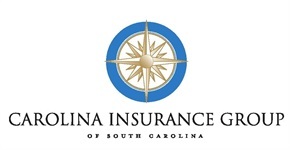 At Carolina Insurance Group, we care about our customers and want to educate you on all your options regarding flood insurance. Homeowners Insurance Typically Does Not Cover Damage from Floods First thing first, we want you to be aware that flood damage isn’t typically covered by homeowners insurance. You may be able to buy a separate flood policy through the federal government’s National Flood Insurance Program (NFIP). 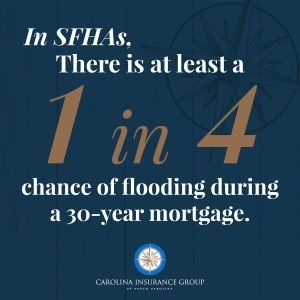 At Carolina Insurance Group, we can help you purchase an NFIP flood policy, if needed. One that covers your actual home (property) up to $250,000. One that covers your personal property up to $100,000 such as clothing, furniture, electronics, etc. What Doesn’t Flood Insurance Cover? 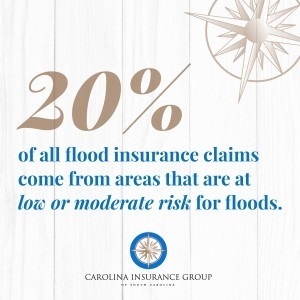 At Carolina Insurance Group, we believe it’s important to educate our customers on what wouldn’t be covered with flood insurance. Here are some types of property and expenses that fall outside the scope of basic flood insurance policy. Moisture or mold/mildew damage that could have been prevented by the homeowner. Currency, precious metals and paper valuables like stock certificates. Outdoor property such as decks, fences, patios, landscaping, pools, wells and septic systems. Most personal property such as clothing, electronical equipment, kitchen supplies, and furniture. Don’t wait for an impending storm to consider flood insurance. 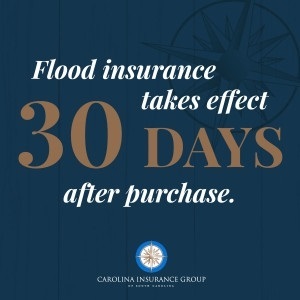 The team at Carolina Insurance group is here for you and if you’re considering flood insurance, we know you’re going to have questions. Contact us today to learn more about your options about flood insurance.